"The New Encyclopedia of Watercolour Techniques" by Diana Craig & Hazel Harrison is the third edition of its series. I found the first edition in one of my local library and read it, cover-to-cover. It had good details, with colored pictures and all, however, the layout of the book was a little off, and I felt it could have used more editing. Thus, when I found this edition, (the third) I was thrilled. The layout used is much more cohesive and easy-to-follow, and it has more techniques and explanations. The book opens with a gallery of watercolor paintings by different artists. I actually really enjoy looking at good Art. (Who doesn't?) Books that showcase other Artists' works are brilliant books, most of the time. The selection of works that were chosen for this book covered a wide range of styles one could achieve with Watercolor, from gestral to tight-and-lots-of-details. The next Chapter talks about materials and workspace, which is an improvement from the first edition.The layout, as I've said previously, is much more "cleaner" than the first edition, and covers pretty much everything you would need to know. The third Chapter is the meat of the book, the techniques in Watercolor. From basic washes to more interesting techniques, like misting and using textures. What I like about this Chapter is that the authors have scattered other Artists' works throughout it to keep it lively and engaging, and of course, to show readers the extent that the technique can be used. All in all, there has been a marked improvement in the layout of the book, and if you were thinking of getting this book, I suggest you get the latest edition. 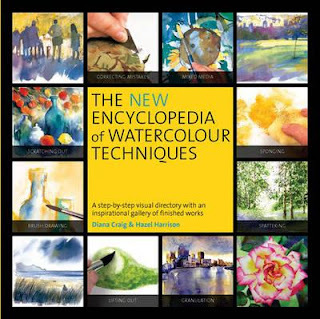 I would say though, this is a book suited for Artists looking for a refresher course, or if you wanted to get inspiration from other Watercolorists' works. Beginners reading this book will get an idea of the possibilities that this medium is capable of, but it is no where an instrutional step-by-step guide book. Which book do you think I should write a review on? Leave me your answer in the comment section below.